I have to tell you something. 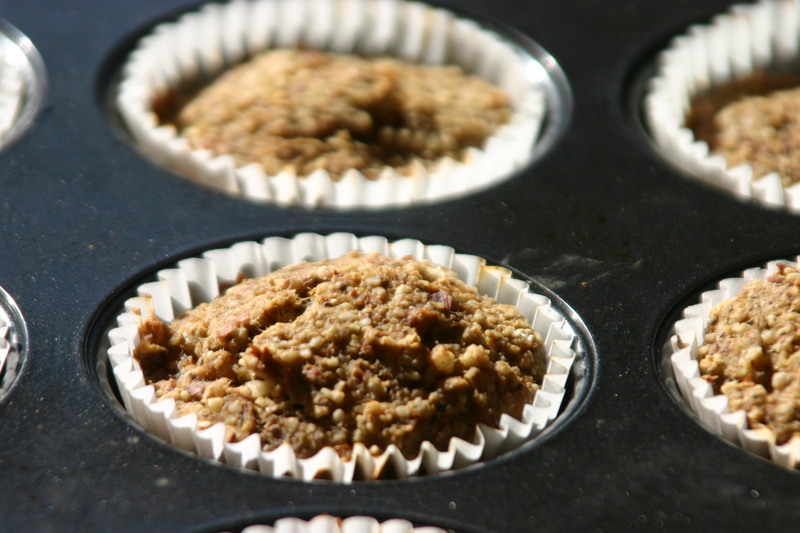 The real reason I posted about making almond milk was so you could make these muffins. Since I posted that recipe on Saturday you must have soaked your almonds Saturday night and made almond milk yesterday. Today you are wondering what to do with the leftover almond pulp. Making these muffins is the best thing you can do with the pulp. These almond banana muffins are flavorful, dense, moist, slightly sweet, crave worthy, and incredibly full of healthy stuff. They are also gluten-free, vegan, soy free, and have no added oil or sugar. What? and they taste good? They do. Especially when slathered with homemade almond or walnut butter. These are perfect for traveling and the last for several days maintaining their delicious texture. This recipe started from this recipe from the Minimalist Baker. In a large bowl, mix chia seeds and water. Next add bananas and mash. Add baking powder, vanilla, almond extract, cinnamon, and salt stirring to combine. Add almond pulp and ground oats and stir once more. Divide batter evenly into muffin tins. If you want a smooth top smooth them before you bake, they don’t really spread out like regular muffins. Bake for 25-30 minutes or until a tooth pick inserted into the center comes out clean.